Purpose-built rental apartments are back and here to stay. That was the consensus view of five panelists presenting case studies and sharing their experiences regarding rental apartment development and redevelopment at the recent Land and Development Conference in Toronto. 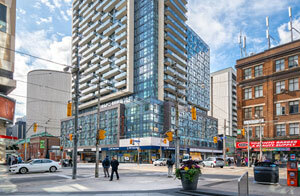 Concert Properties Ltd. investment director Adrian Kozak discussed the company’s LEED Gold-certified Motion property near Toronto’s Bay and Dundas streets (shown in the image). The land was purchased in March 2009, the building first occupied in May 2013 and it took 12 months to fully rent at a rate approaching three dollars per square foot. It has 29 storeys and 463 suites averaging 600 square feet as well as 10,000 square feet of retail at its base. “This is phase two of what was originally a two-phase condo project, so we’re able to take advantage of a lot of shared facilities that gave us the efficiencies we needed,” said Kozak. Kozak also informed attendees of One32 Berkeley at Queen and Berkeley in downtown Toronto, which was originally planned as a 21-storey building, but was reduced several times until finally settling at 10 floors. It has 177 suites averaging 471 square feet and took about two years to rent because it missed a September completion date due to a contractor strike and missed out on potential university and college students. “Students aren’t the best of tenants, so you want to make sure you have strong property management staff,” said Kozak, noting the high turnover rate of student tenants. Tricon Capital Group (TCN-T) director Adrian Rocca discussed his company’s involvement in Calgary East Village, a 49-acre mixed-use development that will include more than 3,900 townhome and condominium/apartment units and 500,000 square feet of office and retail space. Tricon and partner FRAM Building Group will develop seven parcels of land, while Vancouver’s Bosa Properties will develop three parcels. That drop in oil prices has accelerated Tricon’s plans to focus on purpose-built rental and consider flipping one of its Calgary East towers from condo to rental. The Calgary Municipal Land Corporation was tasked with overseeing the redevelopment of Calgary East Village and has committed $325 million for infrastructure improvements in the former industrial area. “It’s one of the most exciting urban master plans that I’ve been part of,” Rocca said. “In the condo market, you come up with a design and pre-sell and if things aren’t selling well, you make adjustments,” said Morguard (MRC-T) vice-president of development Brian Athey. Athey discussed The Heathview, two 30-storey, LEED Gold-targeted towers located in the Bathurst and St. Clair area of Toronto that house a combined 586 suites and 550 underground parking stalls. They replaced two older apartments with 146 units, and most tenants of those buildings have signed on in the new ones — which are about half occupied but not yet fully finished. One of the towers was originally slated to be a condominium, which accounts for the relatively high 0.9 parking stalls per unit ratio, which Athey said is more than what would have been included had the project been started now as opposed to five years ago. “Getting parking right is critically important because the cost of underground parking is an enormous part of a project,” he stated. The units in the north tower average 700 square feet and those in the south average 975. Athey said tenants are prepared to pay the price for a larger unit, particularly if they’re on higher floors and offer better views. He said the buildings are bringing in from $2.80 to three dollars per square foot in rent. Henry Morton knows all about the student market as the president of Campus Suites, the developer and manager of student housing projects across North America totaling more than 17,000 beds. That total includes former hotels in Ottawa and Montreal and The Quad on the campus of Toronto’s York University. Many of Campus Suites’ properties have .05 parking stalls per unit, but a one-to-one ratio for bike parking, and Morton said other amenities may also differ for his tenants. He added that students in the United States have higher expectations for their suites and properties than their Canadian counterparts, and that most of his units rent for $2.50 to three dollars per square foot while a few go for as high as five dollars. Aaron Platt is an attorney at Davies Howe Partners LLP who specializes in land use and tools. He said several municipalities are interested in new rental stock and may offer incentives — including relieving part of a property tax burden or an expedited approvals process that can shave a few months off the time to launch a project — to get the ball rolling as quickly as possible.